Why do so many Takata airbags still need to be replaced? The largest auto recall in history continues to grow, reaching 41 million vehicles this year. Millions of cars are still being added to the Takata airbag recall. It's already the biggest auto recall in history, with 41 million vehicles impacted through this year. 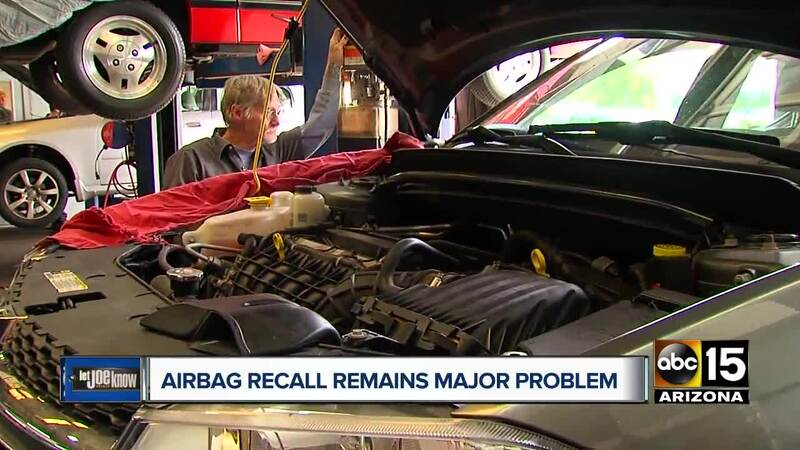 Though the recall started years ago, millions of drivers still don't have replacements. Is yours one of them and you don't know it? Jason Reece knows it, but says he can't get anyone to fix it. He says he took his car to the dealer and was told it might take some time to get the parts. Eight months later, he's still driving loaner cars. Ford provided them for free, but Jason says enough already. He just wants his Fusion to get the fix. At issue are airbag inflators made by the manufacturer Takata. The devices can rupture, sending metal pieces flying out of the bags and into drivers and passengers. Deaths and hundreds of injuries have been blamed on the faulty bags. Humidity and age are factors and have been getting top priority for replacement. Statistics from The National Highway Traffic Safety Administration show how many millions of cars still have not received final airbags. Some that did get replacements now have to be replaced again. Part supplies have been an issue in some cases, but other manufacturers say they have the parts. They say the issue is drivers not bringing their cars in for the recall repair. It could be they moved and didn't get the notices. It's important to keep your information current with car makers so you get all alerts. Or they have just ignored them and are driving around with a potential danger. Jason finally is getting his airbags replaced. His Ford dealer apologized for the delay. UPDATE: We are happy to report that Reece now has his car back, with a new air bag installed, and is happy with the outcome and Ford's handling of the recall. Click here to see if your Vehicle Identification Number shows an airbag or any recall on your vehicle.